Enjoy a unique experience at the brand new M2 Marché-Montréal on the M2 level. With eight new food counters as well as a bar with 16 different beers on tap, a wide selection of wines and cocktails prepared by our mixologists, there’s something for all the hockey fans and foodies out there. 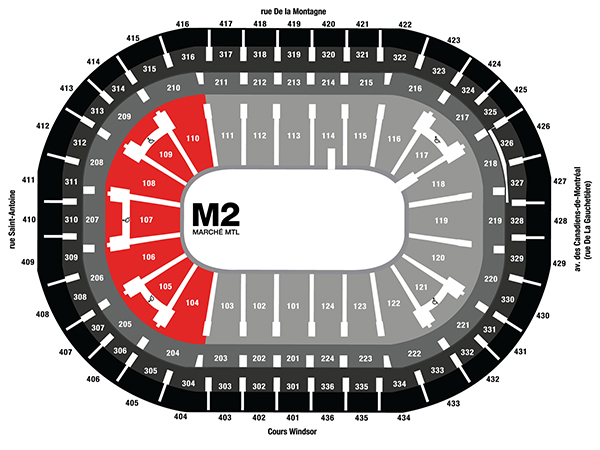 Where are we situated in the Bell Centre? You don’t have to go all the way to Texas to enjoy some delicious BBQ! Try out our sandwiches made with a selection of meats slow-cooked in our smokers. Spice up your night with our selection of tacos and empanadas. Immerse yourself in the Montreal Izakaya scene and enjoy the best Japanese pub food without having to leave the confines of the Bell Centre. The perfect spot to enjoy a classic – burgers, home fries and poutines, each one more unique than the last. Get your sushi fix thanks to Mito! With a wide variety of sushi and poké bowls, Mito will satisfy your cravings with their exotic flavors. Hit with a craving for a drink or a snack? Our new grab-n-go concept will satisfy your urges. A selection of thin-crust pizzas cooked on the spot and topped with a mouth-watering array of ingredients. Let yourself be enticed by the smell of our specialty jumbo dogs – try our mouth-watering fries, flavourful chicken-panko pogos, and delicious poutines! Enjoy these homemade products, made on the spot and served fresh, to satisfy any of your cravings.